Make your bathroom an oasis with a VIGO Sliding Shower Door. 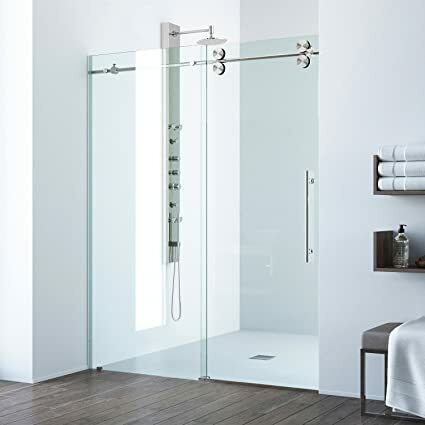 This contemporary shower door combines a sleek frameless design, with superior quality clear tempered glass. Wall mount brackets adjust to accommodate out-of-plumb walls, making it possible to have a seemless installation. Stainless steel construction hardware will not rust, chip or scratch off and is guaranteed for life. Specially designed rollers make door closing smooth and effortless and a top rail support ensures wall anchoring and reinforces wall stability. Clear seal strips keep the shower watertight, preventing leakage. With reversible left or right-sided installation and an adjustable opening up to 4 inches, you have an option to meet your exact needs. Bring your showering experience to the next level by adding a VIGO shower panel and create your own personal oasis.